So after futzing around with ASP.Net 5/MVC 6 for a bit and becoming frustrated with attempting to implement token based auth, I decide to switch over to Node JS using Sails as an alternative for my API. Why Sails? I took a look at it a few months back and was impressed with the easy setup and Waterline ORM. I then had a recent job opportunity where the client was using Sails. I passed on the opportunity but decided to review Sails again. The combination of convention with easy overrides is super productive and flexible. Additionally, the documentation is well done for an OSS framework. I look forward to the eventual rollout of ASP.Net 5, but it’s still under heavy dev and what works one day doesn’t on the next pull. This is totally understandable but I’m ready to move along and get something working. I’m already biting off a fair amount of learnin’ by attempting Node and Aurelia. So without further ado, I’ve added the following growing list of articles on setting up Nozus in node, including examples in GitHub. Nozus JS Preface: Sails with Passport and JWT – Ermahgerd! The previous post in this series covered basic MVC 6 API project setup. In this post, we’re going to build on that and set up some baseline logging functionality in the API. We’ll continue to enhance logging as the project progresses. We’ll start by setting up logging. In our case, we’re going to use Serilog. It’s the new kid on the block for .Net logging and looks like it combines some nice elements of structured data with basic log messages. This can easily be swapped for NLog. Right now there isn’t 5.0 support for Log4Net, but expect that to change. So we just installed JSON configuration support (no more web.config) and support for Serilog. Now lets add a config.json file. Right click on the Web.Api project and Select Add –> New Item… Select ASP.Net Configuration File. This should correspond to a config.json file. Just add the default json.config to the project, we’ll add some things to it in a later installment. I lowercase the file name…optional. We’re going to add logging into the Startup.cs now. Open Startup.cs, add a Configuration property, and set it in the constructor. This will set up config information from our config.json and will also add configuration in from any environment variables that may be set in the deployment environment. Now we’ll update the ConfigureServices method. Configure services sets up services in our DI container. We’ll add in logging by calling AddLogging() and while we’re in here, we’ll go ahead and remove XML as a potential output format. Notice that AddLogging reads in the configuration we read in the constructor. We’re going JSON only with these services. Why? Because I don’t really want to support XML. Leave it if you like. Next, we’ll configure the actual middleware pipeline. For this we use the Configure method. It’s a little confusing that we have ConfigureServices (DI) and Configure (Pipeline), but that’s the convention. We’ll add Serilog as our logger and create a method to set up our logger configuration. Serilog can alternately read from app settings if that is preferred and I’ll probably switch it over to do that at some point. Notice here that I’m writing out to a rolling file on my D drive. You can write to whatever location or writer works for you. Now that we have the Serilog package installed, if you try to compile you might notice a problem. The compiler has some complaints and if you look closely, you’ll notice that it’s complaining about Serilog but in addition that it’s complaining about ASP.Net Core 5.0. Now compilation should succeed. Now let’s put in some basic logging to do an error catch all. So there are a few ways to accomplish this. One was is to use the built in ErrorHandling middleware. To me, this is more geared towards MVC, where one wants to perform some logging and then perhaps render an alternate view from the standard. In my case since this is an API, I just want to log the error and send the standard 500 error out the door. Perhaps I’ll add in a Production mode later that sends an alternate view out. The nice thing is that since ASP.Net is now open source, we can see what the error handling middleware does and just make a simpler version of this when configuring services. Since I just need something stupid simple, I added my own middleware. _logger.WriteError("An unhandled exception has occurred: "
All we’re doing is logging the error and throwing it up the chain for eventual handling by the framework. One really nice thing is that you’ll notice our dependencies are injected into the middleware for us. So middleware is now hooked into the core DI mechanism and is truly first class. Very nice… You can also see the basic middleware pattern. This is the same basic OWIN pattern you may be used to: Middleware is a russian doll where the next middleware component is injected and wrapped by the current middleware component. So in our case we just call the next middleware component and log something if there’s an error. Really easy, the possibilities for open-source/third-party middleware are huge. I expect this to explode with Asp.Net 5. So now we need to call our middleware. In the Configure method, well use the AddMiddleware method to add in our custom middleware. So easy and now we’re set. One thing to remember is that the order of adding middleware determines the call sequence, so it’s important to add your component in the right place, which may differ depending on what you are trying to accomplish. Let’s start up our app and it should immediately err since the error message gets thrown up the chain by our middleware. But if we go to our log file location that we set earlier, we should now have a log file with our error properly logged. 2015-03-11 21:02:58.723 -05:00 Error: [Nozus.Web.Api.Middleware.ErrorLoggingMiddleware] An unhandled exception has occurred: Ghost in the machine! System.InvalidOperationException: Ghost in the machine! Just remember to remove the thrown error before proceeding further….in the next installment we’ll set up basic identity management…then we may switch over to Aurelia before getting back to social logins. This article involves basic Visual Studio and project setup and should go fairly quickly. I’m going to start out by creating a Web Api using MVC 6. For reference, I’m using Visual Studio 2015 Preview 6. Instead of beginning from complete scratch, I’m going to start with the Web API template. From Visual Studio, go to File –> New –> Project. 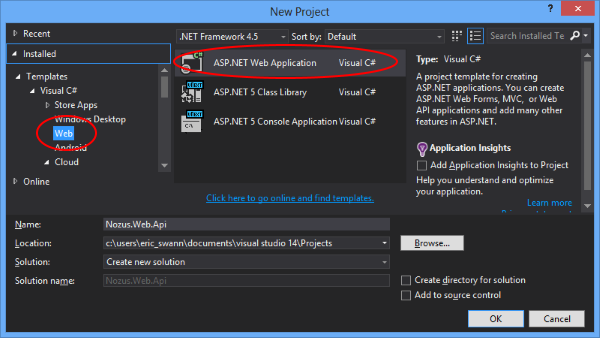 In the New Project dialog box, select Web from the template tree and ASP.Net Web Application as the template. 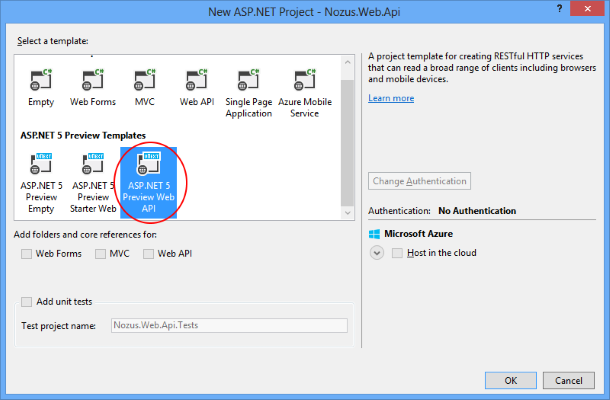 In the resulting web project template modal, select ASP.Net 5 Preview Web API. Note: The Web API template is new with Preview 6. Now lets add a couple of basic projects to our solution to round out the API. A Domain class library for all Domain entities and interfaces, and a Data project for any repositories or EF 7 DataContexts. 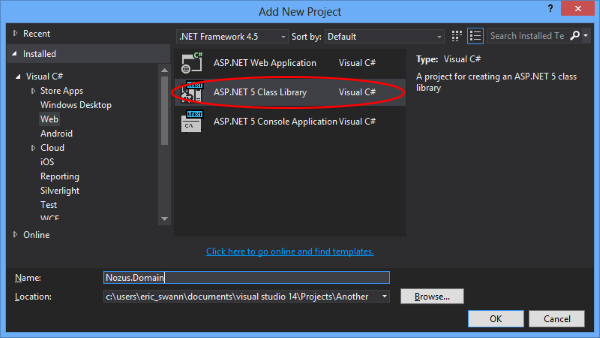 In the Add New Project dialog, select ASP.Net 5 Class Library as the template. Do this twice: Once for a .Domain project and once for a .Data project. The initial structure should look something like the image to the right. Now that some basic project structure is set up…lets add in some needed Nuget packages. The first thing to do is to make sure the Nuget package manager is up to date. You can go to Tools –> Extensions and Updates… Look in the updates node on the navigation tree to see if there are any updates available for the Nuget Package Manager. Now we need to set up the package manager such that it’s pointing to the correct source of packages for ASP.Net 5. Open the Nuget settings by going to Tools –> Nuget Package Manager –> Package Manager Settings. The Package Manager Settings dialog will open. Navigate to Package Sources, and if it’s not already present, add an entry for AspNetVNext packages with source: https://www.myget.org/F/aspnetmaster/api/v2. Before we get started adding packages, lets make sure the packages we have are up to date. 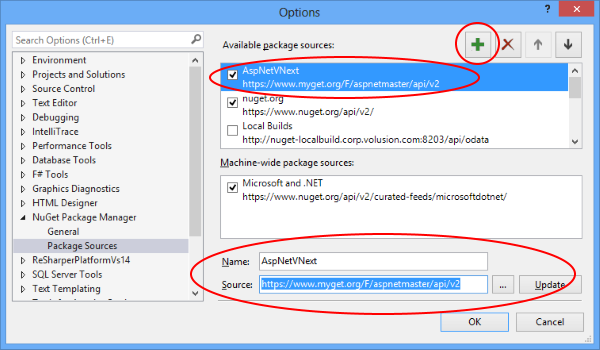 Right click the solution node in the Solution Explorer and select Manage Nuget Packages… In the Nuget Package Manager dialog, select the AspNetVNext source with Upgrade available and Include prerelease as filters. Install any available official M$ upgrades. If you open your project.config in the Web.Api project, it should look something like the structure below. We’ll talk more about this structure with the next installment. In the next article, we’ll set up basic logging and then identity management. I was beginning to work on a new exploratory project where I wanted to get a little deeper into some technologies that I don’t get to use every day at work. I’ve got a plan to build a cloud-based web site that does a few things. So the choices were Angular or Aurelia on the front end and Node or ASP.Net 5/MVC 6 on the back end. I’ve been doing various Node and Angular exercises and tutorials for the past year or so and have also been excited about the release of ASP.Net 5 and what it promises. Although I’ve been put off by the recent Node schism, I’m fully confident that either a reconciliation will take place or IO.js will run away with the ball. And the Node/IO community is so incredibly vibrant right now. It seems like there’s a package for anything/everything. You can literally see the energy coming off of that system. Recently, I’ve also been impressed by the Aurelia project and it’s embrace of ES 6 and other emerging and established standards. Aurelia will probably be a niche player in the SPA market when compared to Angular/React/Ember etc…, but it’s a really cool and looks well put together, so why not try it out. But as cool as Node is, there are things that I’ll miss terribly in the .Net ecosystem like LINQ and (a hopefully more performant) EF and truly awesome productivity tools in VS and R# as well as all of my previous experience. I also want to support .Net’s move into OSS and embrace/trust its own community. Already the source code out on GitHub has been an incredible help to me. I think that’s already paying off. Well, Fpr had to get a newer, less adolescent name….so it goes. New name, same great performance! Check out Mapster on Nuget or GitHub. src – The untranspiled source. dist – The transpiled source. build – The build files. I typically put a paths file inside of build that has all of my project path information for conducting builds and add add a tasks directory under build for the actual build tasks. Now define your main gulpfile.js in the root project directory. It simply uses require-dir to require all files in the build/tasks folder (to pull in all tasks).